Looking for a rimfire ar m4 type rifle....which one is quality and most authentic in terms of funtioning conrols etc. School is in session...I am your student sensi's..
We have three SMITH WESSOM M&P 15-22's in the family. My wife, son and I each have one. The Ruger is good because you can use the magazines with your 10/22, but it's no AR-15 trainer. Other option is an AR-15 with a 22lr upper. Weighs a bit more but just as good. I like my SR22...Oh wait I own no guns..
My path is more clear now. Another vote for the M&P 15-22. I never thought I would find a .22 that I like better than my Ruger, but I was wrong, this little gun is big fun! We're so badass, our flag has a confirmed kill! Any one you can find right now. I have two and they are the best! No pot metal in the 15-22. I have a Colt M4 tactical and despite all the hate out there, I like mine. It's accurate and reliable. Now...the 30 round mages are too long the bolt release is ornamental and the fire selector switch needs to rotate 180 degrees to the fire position (where full auto lives on a class III) so that's odd and slightly awkward. It also offers metal upper and lower, which I greatly prefer to plastic and the use of pot metal inside the Colt M4 Tactical offends me a lot less than plastic receivers. In the M4 it's use offends many but it's actually solid engineering for the application. I also have a CMMG dedicated upper on an M4gery lower. With the proper accessories you'll get a functional Bolt hold open and bolt release along with a functional forward assist. It's also accurate and reliable and the weight and balance is close to the real deal. The design of the bolt and barrel allows you to go slightly shorter and get closer to the actual M4 14.7" external barrel length rather than the usual required 16" barrel length as the dedicated barrel extends inside the receiver and takes up another inch or so. If you want to get the most in terms of operating controls that mimic the M16/M4, then that's the way to go. Did someone say 15-22 thread? I see your OD Green and raise you an FDE! DAM! I gotta get pics of my Foliage Green set up now! 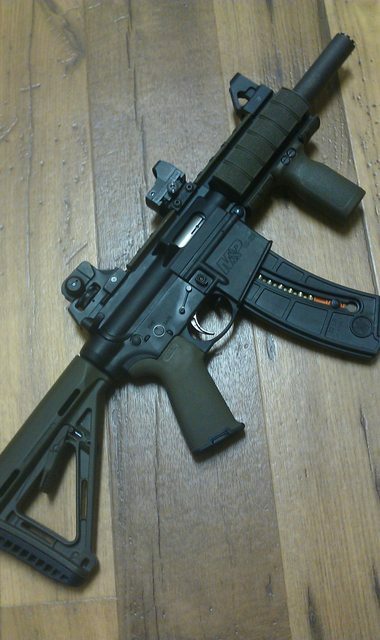 We can corner the market on Magpul 15-22 colors in this thread. I hang my head in shame I have not done anything to mine yet. To save some bucks do you think it would be OK to use PTS stuff ? 15-22 is a great platform. Someone referred to it as a plastic toy. Kids can shoot it easily. Toys are fun!!! Just bought my daughter the platinum pink S&W 15-22, now to try to find a spare mag or two at a reasonable price .